Thanks to turbochargers and hybrids, engine displacement is no longer indicative of performance. The Germans are quite good at sifting through confusing nomenclature. Just think, these are the same people that invented the enigma and the confusing numerical and alphabetical combinations they use to name their cars are indicative of this. And now, as we find ourselves on the cusp of change brought on by electric drivetrains, German automakers are having to change badges up once more in order to properly advertise to the world how much power each model makes. BMW, Mercedes, and Audi have all coined names for their electric car brands, with i, EQ, and e-tron being the respective designations for these three German automakers. Mercedes had to break rank when it decided add the “53” suffix to the AMG CLS model in order to designate it as a hybrid AMG model, and now Audi has just announced that it will do something similar, although its change in name scheme won’t be exclusive to performance models. Instead, it will reflect a vehicle’s power output, a move done in order to disassociate engine displacement from a model name given that turbocharging technology and electrification has made it so that displacement isn’t necessarily reflective of power output. Future Audis will see two numbers that designate power output in kilowatts. This goes for cars with internal combustion engines, hybrids, and fully electric models in the lineup. For vehicles making between 81 and 96 kilowatts (108-128 horsepower), Audi will use the number 30. The number 45 will stand in for vehicles making between 169 and 185 kW (226-248 horsepower), while Audi’s top line performance models, those making above 400 kW (536 horsepower), will garner the 70 moniker. Model series names, from A1 to Q7, will remain the same, however the numbers will replace previously used designations. 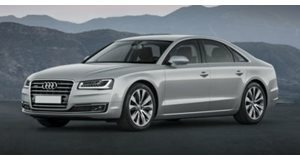 For example, the new A8, the first model to see this change, will be badged as an A8 50 TDI when spec’d with the 3.0-liter diesel V6. An A8 buyer who selects the 3.0-liter V6 gasoline engine will receive an Audi bearing A8 55 TFSI badges. Soon after, all Audi model series launched on the market will get the new performance designations in order to help us determine which Four Rings vehicles we can beat to the next stoplight and which we should lay off of. It might be confusing at first, especially because us Americans aren’t used to using kilowatts as a stand in for horsepower and because the numbers are more of a ranking rather than a direct reflection of output. Either way, the fact Germany has found a way to make naming its cars more complicated should surprise no one.